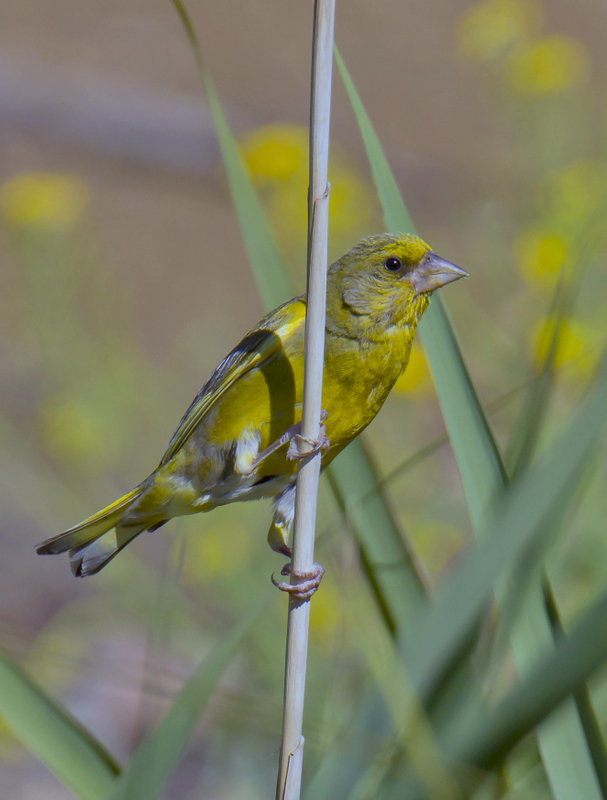 Birds in Tasmania: Gould's Lagoon... The "Others"
Before the "excitement" at Gould's Lagoon over the sightings of two Baillon's Crakes (see previous blog) becomes a distant thought, albeit a memorable one, it's worth mentioning other sightings. I'm not a patient birder at the best of times, but to photograph or even sight the "Baillon's" required considerable sitting or standing in a chosen spot for hours, yes hours. 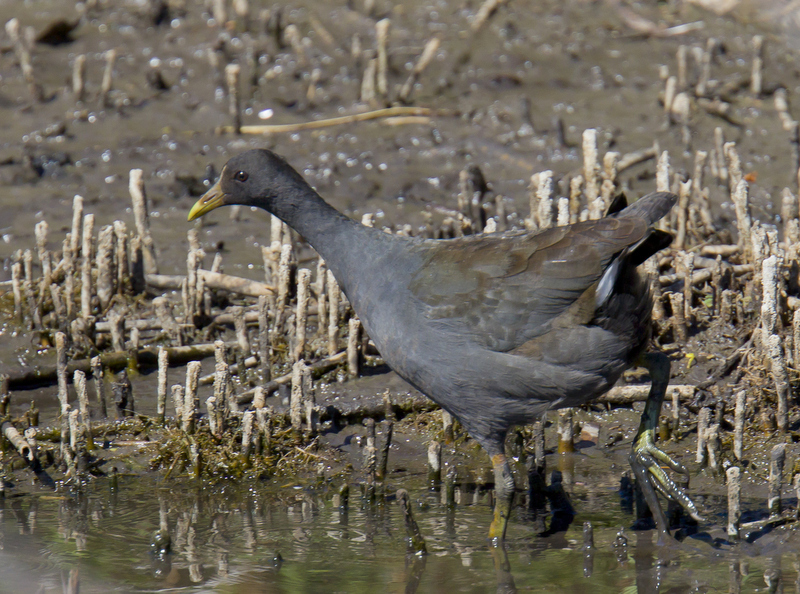 I should recount here that one local, 'nameless' birder, recounted that he had spent a total of 17 hours looking for this crake, before finally succeeding--I'm not sure what to say about that feat! During my sojourns sitting in the hide, or wandering around the lagoon perimeter, there were plenty of distractions, not including the human ones (the lagoon is very adjacent to a major suburb). The early morning visitors usually started with Welcome Swallows, mostly family groups, hawking for insects, with the occasional individual 'propping' on a large post in front of the hide. This is usually followed by a visit from a Swamp Harrier (image) looking for breakfast, and its' presence is usually heralded by the strident calls of the numerous Masked Lapwing that temporarily leave their roost on the nearby railway embankment, to harass it. I do wonder whether they do this from habit or perhaps just enjoy the pursuit, since they no longer have young to protect. 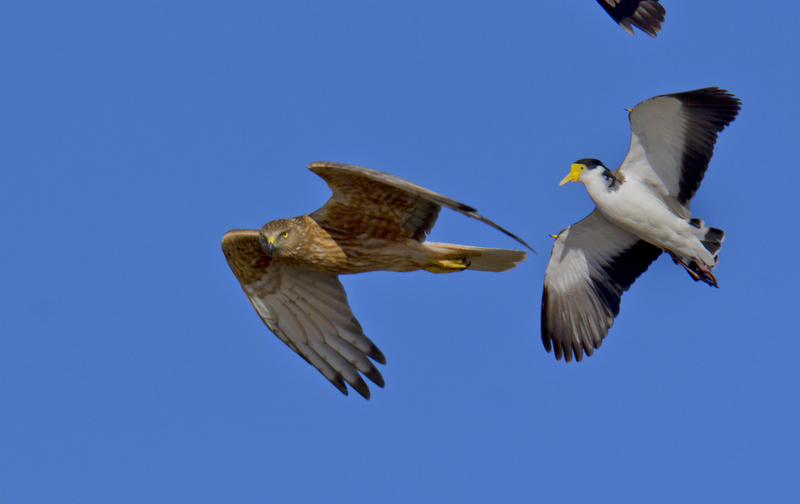 There is little doubt that these harriers do take a substantial toll on the young of several species that breed in and around the lagoon, but the area would be the 'poorer' if they were absent. 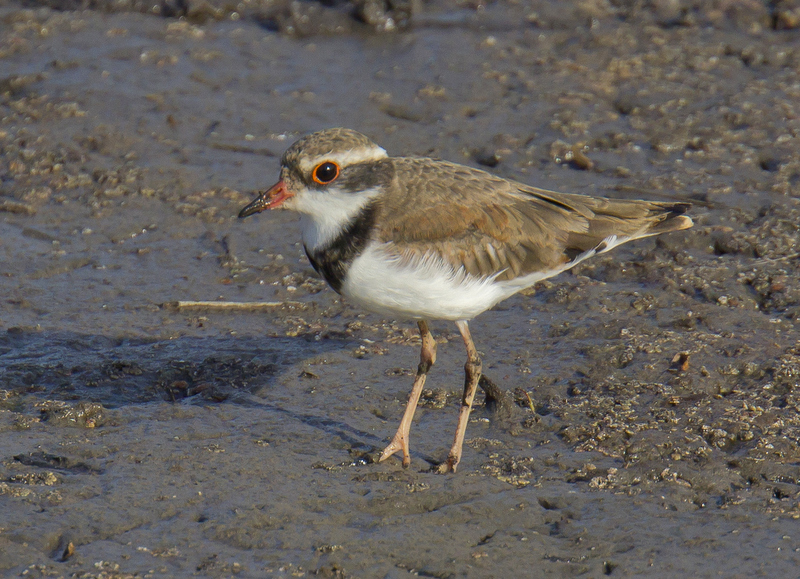 While wandering around, I watched two Australian Crakes (image) swim across a gap between reed clumps, one stopping en route to grab a small fish, while a few metres away on the dry crust, 3 Black-fronted Plover (image) "ticked" away at my presence, before taking flight. 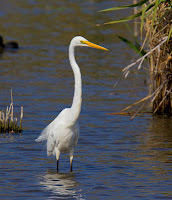 Two Great Egrets (image) have been present much of the summer, but have lately been joined by three others, and together with Australian Pelicans, have feasted on the small fish in the ever diminishing eastern lagoon. Arguably the highlight of my recent visits and one that nearly 'got away', was the arrival of a single young Swift Parrot (image). The Swift Parrot is listed as endangered under the Tasmanian Threatened Species Act, so any sighting away from their known areas is noteworthy. 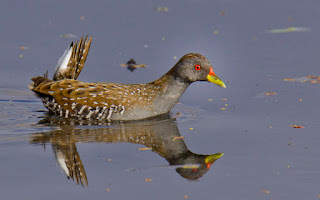 The truth is, at the time of its' arrival, I was deeply engrossed in photographing the Baillon's Crake, which was slowly making its' way towards me, and my concentration was such that everything else was virtually shut out. 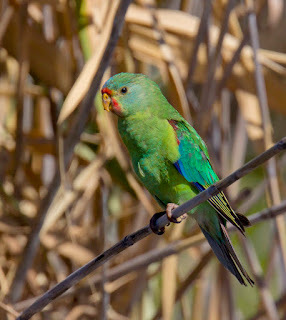 I did notice its' arrival on a nearby reed stem, but as Musk Lorikeets could be seen and most certainly heard, only a short distance away, I assumed that's what it was. Fortunately, because it was in an unusual habitat (not a flowering eucalypt! ), I took a few shots anyway, then returned to the crake. The crake shortly moved out of sight and I was able to return to the "lorikeet". Then the penny dropped! The lack of the long tail of the adult 'threw me'. It was obviously aware of my presence, but flew down to the water's edge and first drank, then partially immersed itself in the dreadful looking lagoon water. It was actually in sight for nearly 5 minutes, but my mind was so focused on the crake that I didn't really make the most of this unusual event. I can take some comfort in the fact that only a few minutes later the 'Baillon's' made its' closest approach and the best photo.opp.--so what would have been your choice? I think that if the Swift Parrot had been in full adult plumage, I would have "twigged" a little earlier and would have had my undivided attention.As it is, I should be rejoicing in the fact that a young endangered parrot had fledged. I understand that much of the previous year's breeding attempts had been "thwarted" by Sugar Gliders. "so what would have been your choice?" I hope I would have done the same as you - get photos of both! Beautiful shots, and beautiful birds, thanks for putting this up. I hope your recent visit to Tassie from Canada lived upto your expectations. It's always interesting to see ourselves through others eyes. If it had been an adult Swift Parrot in fuill plumage the parrot would have won, but as you say I managed both.